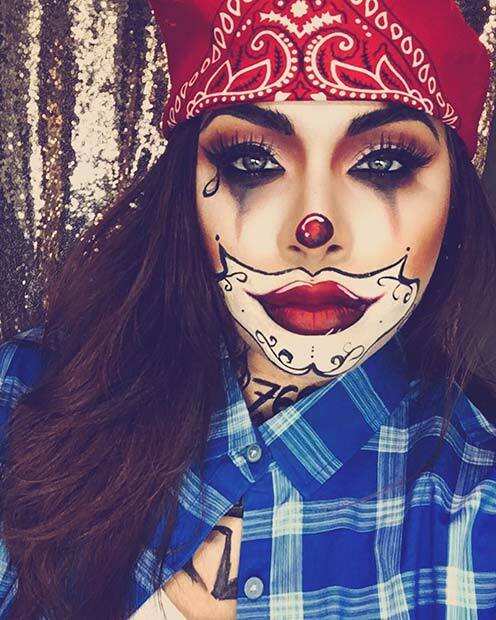 Earlier in the post we featured IT makeup, here is another idea but this one is a little more scary. This design features his horrifying sharp teeth. You can create illusion teeth like this artist or you can recreate the clown makeup and buy teeth like IT’s. Either way, you will have a terrifying look. A red balloon is a must with this look. Roll up, roll up and check out this glam circus clown idea. 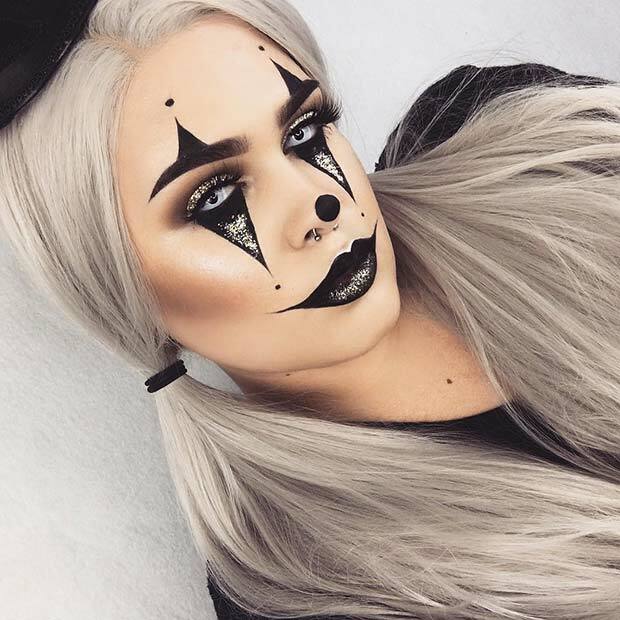 This makeup design features a classic clown look with added sparkly glitter! We love the use of glitter on this design because it captures the magic of the circus. 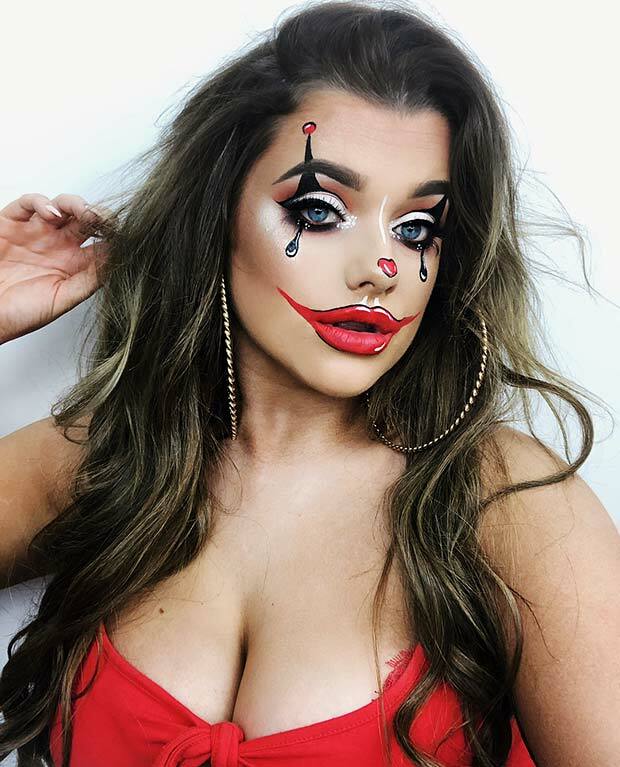 Makeup like this is perfect if you want to look like a clown but don’t want to be scary. Use the image as inspiration to create a similar look or try the design with your own colors. Our next idea features a cute clown design. The artist has used all the key clown features such as a red nose and red lips but used them in a pretty, not a scary way. We love the heart on the nose too! If you want to spook it up a bit, just add some contacts. The makeup will be awesome for Halloween either way. 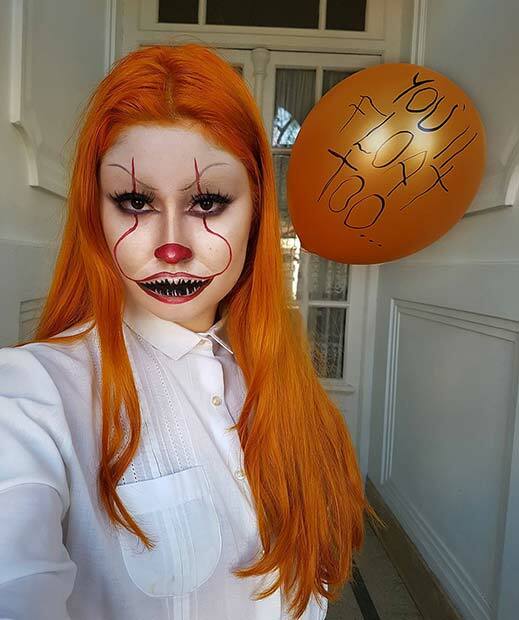 If the classic clown with red makeup is not for you, then you can try something like our next idea instead. 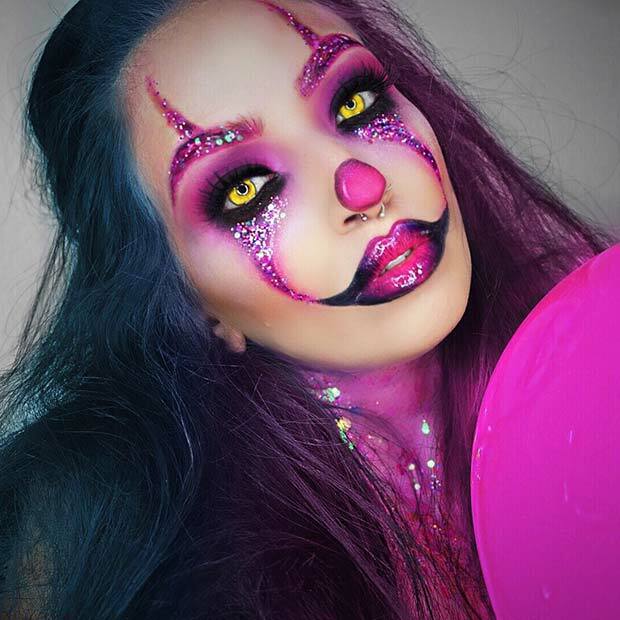 Here we have a vibrant pink clown design with bright contact lenses. Even though the colors are bold and happy, this is still a very creepy look. Use the colors featured or try your own color combination. Be a rebel this Halloween with the biker chick clown! 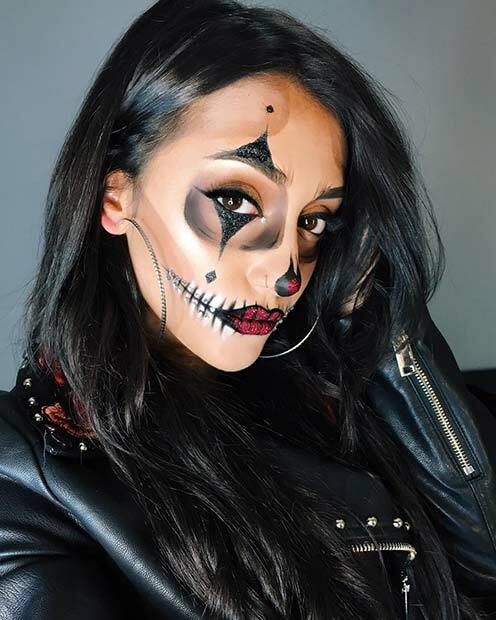 The artist has created a skeletal clown look and rocked it with a leather jacket. This a fun and unique way to let out your inner rocker and dress for Halloween too. Recreate this design or create your own. 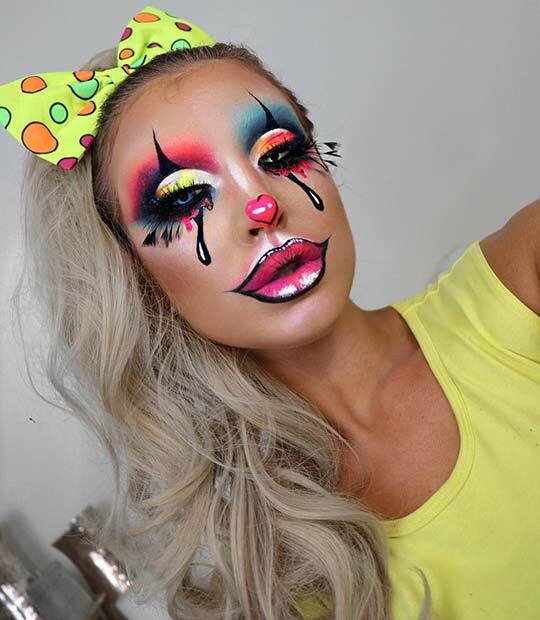 Next, we have unique clown makeup idea. This is one is unique because it uses a combination of new and classic colors with different clown styles. It is like a mash-up of clown makeup. Wear this to a party and your Halloween look will be a hit. Finish the look with big hoop earrings and plaid shirt. Super simple! Just because a clown looks scary, doesn’t mean it can’t be sparkly! Here we have a creepy clown idea that features gold glitter. Black makeup and glitter creates a statement, perfect for Halloween. Recreate this or try a different glitter color. Try to match it with your contact lenses for a coordinated look. Our next idea is another take on the skeleton clown. This artist has used amazing shading to create a sunken skeletal look. 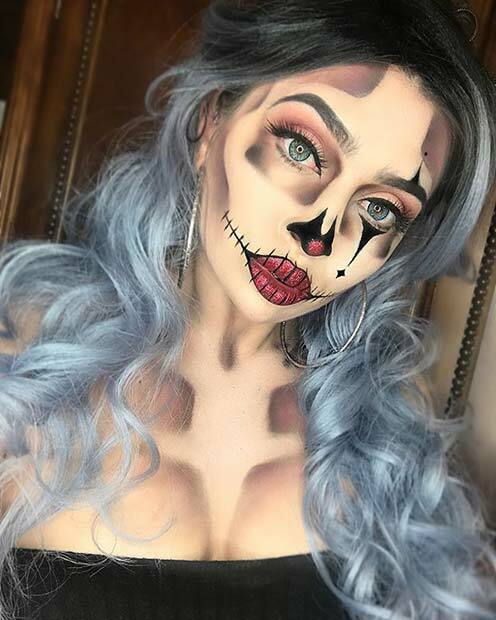 You can use this skeleton design and combine it with any clown makeup or take inspiration to recreate a similar look. Either one would be a great choice. Want to dress up for Halloween but look pretty too? Then this is the makeup for you. The artist has created a clown design with the classic eye makeup and red lips but is looking stylish too. She has achieved this by putting glam eye makeup on. You can use this design or maybe try it without the middle shaded line for a low key look. Next, we have a cute and colorful makeup idea. 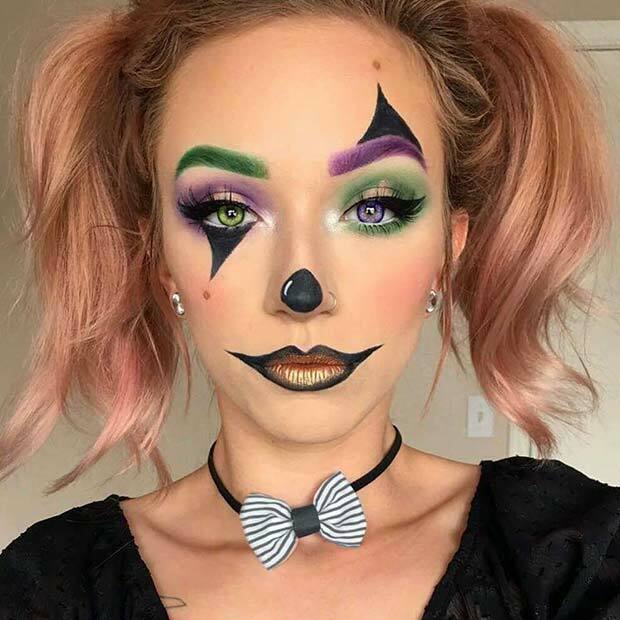 The design features purple and green makeup that has been used on the eyes and eyebrows with a clown nose and lips. You can recreate this for a fun Halloween look or take inspiration and use your own two colors. Love IT inspired makeup? Then this idea is for you. 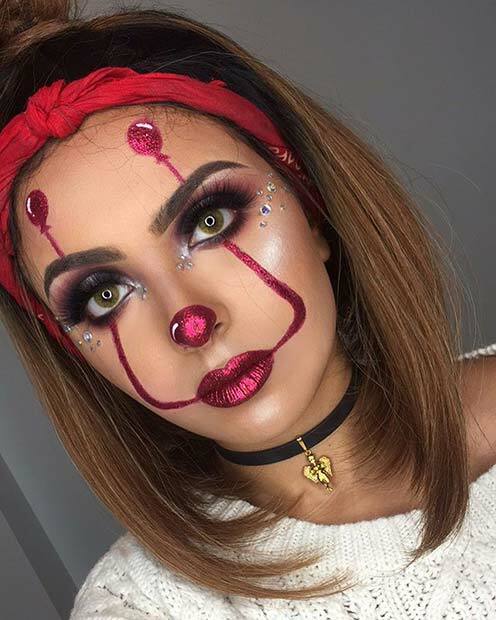 The design features red makeup like the movie with the addition of the iconic balloons. Makeup like this is great for anyone who likes the movie but wants a makeup look that is more unique. Our next idea is another gangster clown. 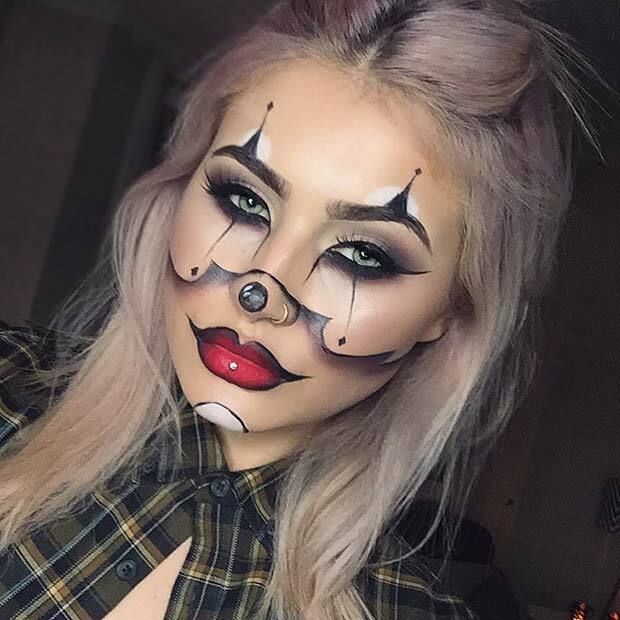 It is a cool idea and is perfect if you want a clown look, but not the classic scary kind. 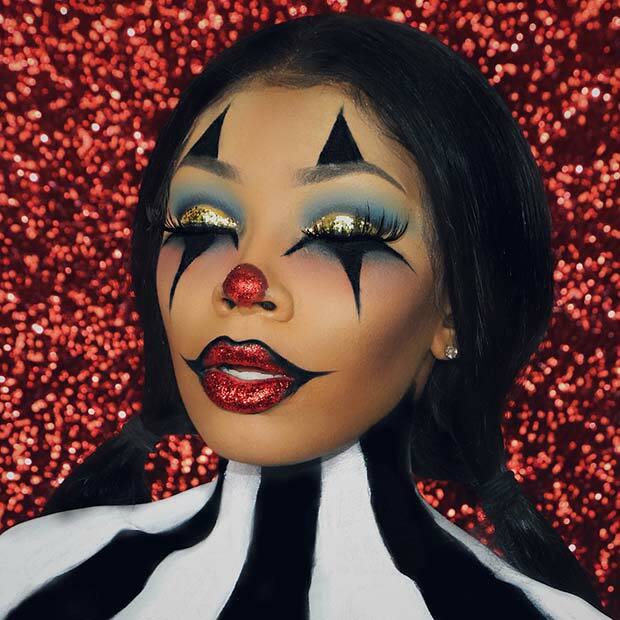 Recreate this look or take inspiration and use different colors or styles to create your own unique clown makeup. This would be a great idea for a last-minute Halloween costume since you already have everything needed in your makeup bag and closet. 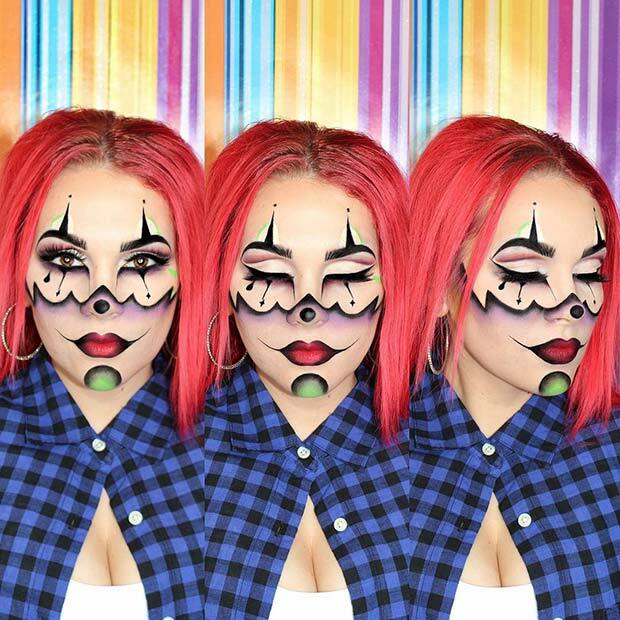 Last on our list is this creative clown makeup idea. We love this design because it is cute and creepy. The colors used are bright and bold, the eyelashes and nose look amazing too. It is the contacts that make the clown look a little scary. Either create a similar look to this or leave out the contact lenses for a happier looking clown. 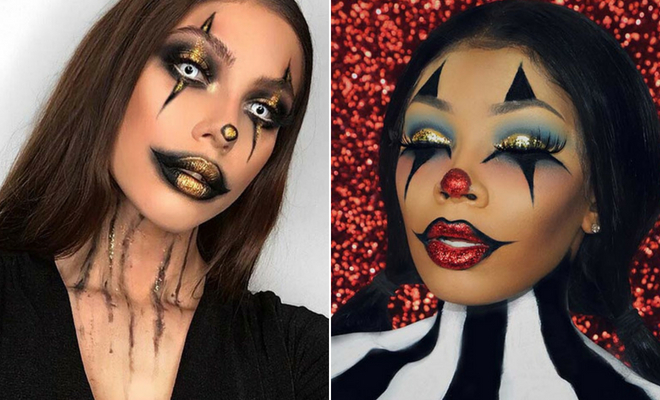 We hope you have found the perfect clown makeup for Halloween!